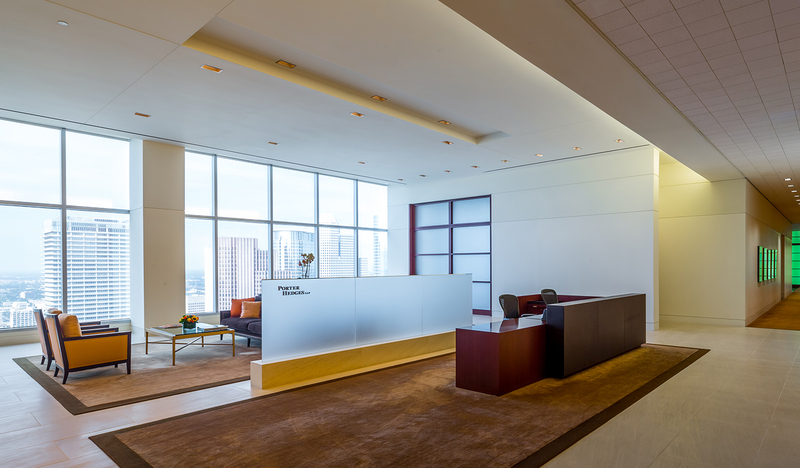 The Porter Hedges law firm renewed its lease in downtown Houston. HOUSTON – Porter Hedges LLP, a Houston-based law firm, has renewed its 105,000-SF lease in the 1000 Main building in downtown Houston. CBRE’s Charles Gordon, Brandon Clarke, Paul Penland and Ryan Roth represented Porter Hedges in lease negotiations with the landlord, 1000 Main LLC, which was represented by Wade Bowlin with PM Realty Group. 1000 Main is an 837,161-SF, Class A office tower located in the heart of Houston’s Central Business District. Other notable tenants in the building include Shell, Sanchez Energy, UBS, and NRG Energy. Downtown Houston has seen rising vacancies as energy companies have reduced the size of their offices and put excess office space on the sublease market. The availability rate for Class A downtown space in the second quarter was 20.2 percent, CBRE reported. The 1000 Main tower, formerly known as Reliant Energy Plaza, was developed by Richard Everett of Century Development. The 36-story building, completed in 2003, was designed by Gensler. In 2015, Hamburg, Germany-based Union Investment bought the 1000 Main building for approximately $440 million or about $525 per square foot.